Rosie Huntington-Whiteley and Jason Statham's baby boy is here! Rosie Huntington-Whiteley and Jason Statham’s baby boy is here! Model Rosie Huntington-Whitely and her actor fiance Jason Statham have announced the arrival of their first bub – a gorgeous baby boy – in a cute black and white picture posted to Instagram. Revealing on Wednesday that baby Jack Oscar Statham arrived on Saturday June 24 weighing just under 4kg. 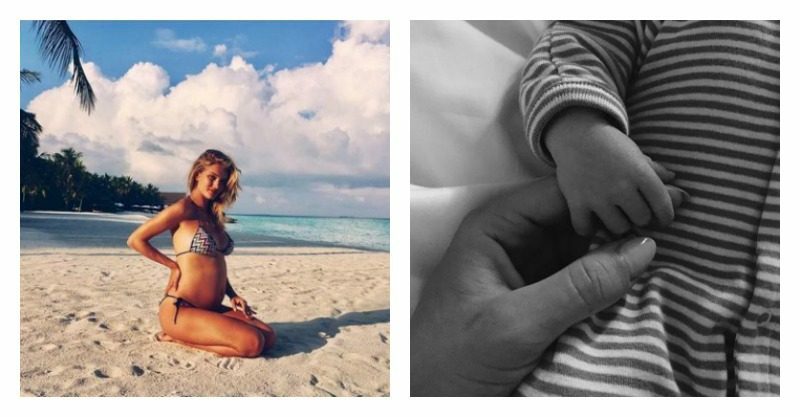 The 30 year-old model turned actress shared a beautiful photo of her holding her tiny newborn’s hand on her Instagram account. The model revealed her pregnancy news in a similar way, announcing that her and 49 year-old fiance Jason were expecting, in a bikini-clad photo of her in a on a tropical beach proudly sporting a gorgeous baby bump. Snapped by her devoted hubby-to-be, she captioned the photo, “Very happy to share that Jason and I are expecting!! Lots of love Rosie x”. Rosie celebrated her baby’s impending arrival last month on May 20th with a neutral themed baby shower where 40-50 friends attended and dined on healthy snacks. Apparently the former Victoria’s Secret model and her long-term partner were aware of their baby’s gender but kept it a surprise for everyone else, until now. Since announcing their pregnancy, the couple have been laying low and keeping fit and healthy – an active lifestyle being very important to them. Despite an almost 20 year age gap, Rosie and Jason have been together for seven years and got engaged in January last year with The Fate of the Furious star proposing with a five-carat diamond ring worth more than $US400,000 ($526,000). Both originally from Britain, the star couple are now based in LA for career opportunities and have been looking forward to starting a family for a while now. He looks pretty perfect to us! Congratulations on the safe arrival of little Jack you two!